Do you guys watch Southpark? I love that show. It’s inane and it makes me laugh (on alternate days, it also makes me want to throw up, but meh… it’s a give and take). The other night I tried and failed miserably to impersonate Cartman (one of the show’s characters). As a matter of fact, I think it was the same night I told you guys about, when Nuggie and I were at happy hour and I thought I should try to put those Bassett Hounds on sets of long legs to see what kind of dogs they would resemble if they weren’t so short and waddle-y. My impersonation of Cartman was so bad, even I was embarrassed. That’s huge. So there we were… Nuggie and I, strolling down Main Street in Santa Monica, while I tried to say “Paiiiiih” (that’s “pie” in Cartmanese). This, THIS ladies and gentlemen is why Nuggie attended college, and studied acting and dramatic arts in London… so he could help me perfect my Cartman. And boy is he GOOD. You see? College is so important. Click to tweet something fun from this post. 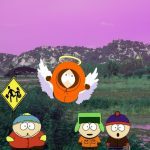 19 Responses to "When Nuggie was my Cartman coach"
Well, it’s a good thing he did go to college or how would you have never perfected Paaaaiih. Money well spent! Ahh yes Elyse… Seinfeld is also in our rep. Not that there’s anything wrong with that. In-coming Sacrilege! I’m not a South Park or Seinfeld fan. Sorry, I guess, then again, maybe not. But, I have followed others who have so valiantly attempted to imitate a show’s character. My sons are constantly doing that – the youngest is 34 – and South Park is one of their fav shows. Still, my wife and I have our moments of silliness and if we knew somebody was following us – would be so VERY embarrassed… and have been! Enjoying life together, even if you’re just Cartman for a day and wanting Paaaaiih, it’s worth it. I die laughing. haha. This is something that my friend and I would do on the regular. We recently went out to dinner and played out the whole “Phase 1: Collect Underpants. Phase 2: …. . Phase 3: profit.” skit. haha. That show is full of gems and perfecting our Cartman is essential. Thank goodness for Nugget. OMFG Sabrina! I remember that one! BAHAHAHA! There’s some paaaaaiih over hh-yaw!!!! I don’t watch South Park much, but I’ve seen enough to know the voices. And you even had me to trying to say ‘PAAAAIIH’! 🙂 Fun post. 1. “on alternate days, it also makes me want to throw up, but meh… it’s a give and take” So. True. 2. If I want to sound like Cartman I just go around pronouncing “here” as “hyeah” and I’m good. I do it more like “HH-YAW and HH-YAW”… LOL Thanks Sarah! I just wish someone had been video-taping this little exchange – we ALL would have gotten a big laugh! Thanks . . . although I NEVER watch South Park – it would have been fun seeing you two! ha ha! For us who live on Mars in another century the foregoing is remote and abstruse. But looks like good harmless enviable fun. Wish I were there too.